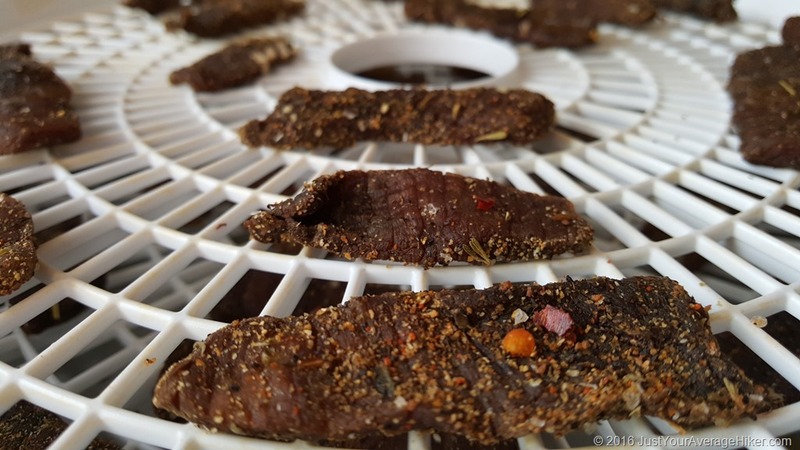 Welcome to the first of many “Just Your Average Recipe” posts… I had the good fortune of receiving a dehydrator for Christmas (specifically, a budget-conscious Presto 06300 Dehydro Electric Food Dehydrator – $33.99 at time of posting). I’ve since gotten 4 extra trays as this model supports 8 trays maximum. With that, I have been doing several rounds of jerky, and just about everything else in the process. Almost every food product I hold in my hands, or food that I cook… I think about dehydrating it. Today’s test batch of Jerky was Hickory and Apple Cider Vinegar Jerky. Cut the Eye Round steak into 1/8”-1/4” size strips, cutting off any extra fat. Set aside. Mix vinegar, olive oil, seasoning and liquid smoke in a gallon freezer bag. Add in jerky. Let marinate between 12-24 hours. The longer it marinates, the more flavorful it will be. Don’t leave it in your fridge for a week… it’s meat. And that stuff goes bad. After marinating, dry each strip of steak as well as possible, and sprinkle some of the Hickory Smoke Seasoning on it again for added flavor. Set it on the dehydrator, spaced apart so no pieces are touching, and let it go 8-12 hours. Check about every hour after 2-3 hours for the thinner pieces, they might be ready to go sooner. I occasionally check each strip for juices and wipe it clean. The jerky is ready when it is bendable, but does not crack. Place the jerky in a tightly sealed container, and enjoy! Vacuum sealing provides a greater shelf life. If you make it, share it here and let me know! This entry was posted in Backpacking, Camping, Food, Hiking, Recipes and tagged Backpacking, beef jerky, camp, camping, dehydrating, dehydration, dehydrator, Food, Hike, Hiking, jerky, meat, preservation, preserve, Recipes, snack, snacks, trail food. Bookmark the permalink. Since getting into long-distance and ultra-light backpacking, we started dehydrating some foods, too. I love it. Mahi Mahi jerky marinated in half soy sauce, half teriyaki sauce is incredible. Lots of pepper, too course, too. This recipe of yours sounds great. Never thought to try apple cider vinegar. Looks like I have a new recipe to try. Thanks,!